Experts from the world’s leading professional service firms participated in Wake Forest School of Business Innovation Weekend Nov. 9 – 10. 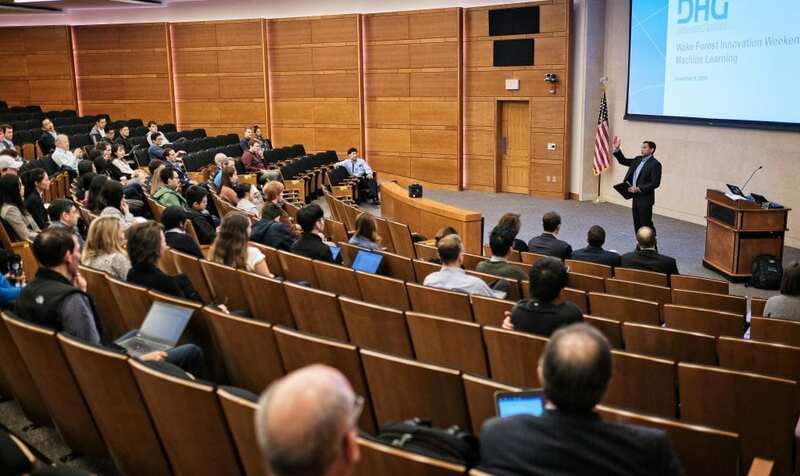 More than 300 students, faculty, and staff had the opportunity to hear from industry experts on how artificial intelligence is disrupting the industry. The event was organized by the School’s Master of Science in Accountancy (MSA) program and held in Broyhill Auditorium. Innovation Weekend participants had the opportunity to network, interact, and hear presenters from Dixon Hughes Goodman, Deloitte, KPMG, FTI Corporation, PwC, and EY. The experts shared how machine learning, natural language processing, cyber, blockchain, social media, robotics, and advanced data visualization are impacting business. While each topic varied, the central theme shared by industry leaders was the vital importance of balancing technology with human interaction. The experts encouraged students to focus on the business problem and the processes to get there – not the technology. Denny Ard, partner with Dixon Hughes Goodman’s Professional Standards Group, shared during a presentation on machine learning that 90 percent of the world’s data was created in the last two years. Trends indicate that figure could double every 18 months. It’s a tsunami of data that Ard says professionals with competencies in data literacy, critical thinking, problem-solving, change adaptability, and project management are best equipped to tame. “People have access to data, but they don’t know what to do with it. Business professionals need to become more data literate so that we know how to leverage it to make informed decisions,” he added. Wake Forest alum Nilan Patel (BS ’16) works as a senior associate in KPMG’s business optimization practice and shared how the firm is using natural language processing for its financial services clients. He credited Wake Forest with providing him the skills to pivot seamlessly into a technology role. A number of students from the School helped execute the event and were led by Vibhav Kollu (MSA ’19), who served as the student coordinator. He helped manage volunteer schedules and speaker introductions as part of his responsibilities. Innovation Weekend was presented in modules by subject, allowing attendees to select which topics aligned with their area of interest. Many students like Janelle Lewis (MSA ’18) invested the time to listen to all nine presentations. A future auditor, she said that the lectures offered insight into what she will likely face with clients. Vuncannon is a strategic communications and public relations professional based in Asheboro, N.C.